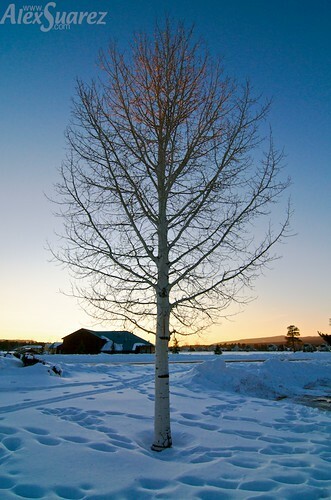 Leafless Aspen Leaf, originally uploaded by Suarez. This Aspen tree also caught my eye. I love how the silhouette of the tree mimics the shape of its leaf (hence the title). Also, the coloration near the top is the last rays of direct sunshine as the sun had just set. Aspen Attraction, originally uploaded by Suarez. 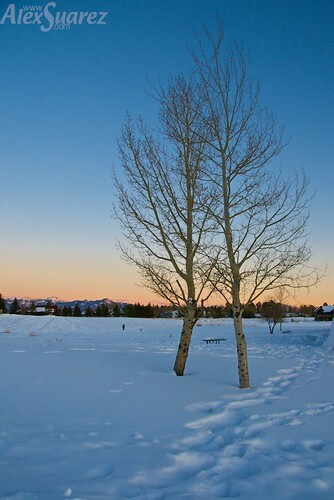 These two Aspen trees that were leaning toward each other caught my eye. The twilight glow on the horizon was especially nice.